For Tanzania the month of October is normally a month for National examinations for students who are completing their ordianary level secondary school education. At Hanga Seminary, this year, there were 35 students who sat for the exams. Following their exams, a farewell party was held for them. Relatives, friends, monks and other invited guests were present for the graduation ceremony. This was the 35th graduation of the school. Noteworthy for the graduation was the guest of honor, Fr. Julian Bombo, OSB, who is a former student at the school. We pray and hope that like Fr. Julian Bombo, who was a student at the seminary, the students who have just graduated will follow same foot steps to become priesst and or monks. At best we hope and wish them success in their lives having practiced good moral life rules at the seminary. Pictured below is the graduating class of 2012, standing on front line at the center in white habit is Fr. Chrysostom Mkulasi, OSB, the headmaster/rector of the seminary. St. Bernard's Hanga Abbey dispensary has always been staffed by volunteers from many parts of the world. It is a joy for our understaffed dispensary to have extra hands to help patients at the dispensary. This year, 2012, we have had four volunteers working at the dispensary. David Andrew from Oregon Institute of Technology in Oregon, USA, worked there from July to September. A man with great enthusiasm radiated his zeal to all the workers at the dispensary. From Italy were two volunteers who worked for a month or so. These were Michelle Grandi and Chiara. 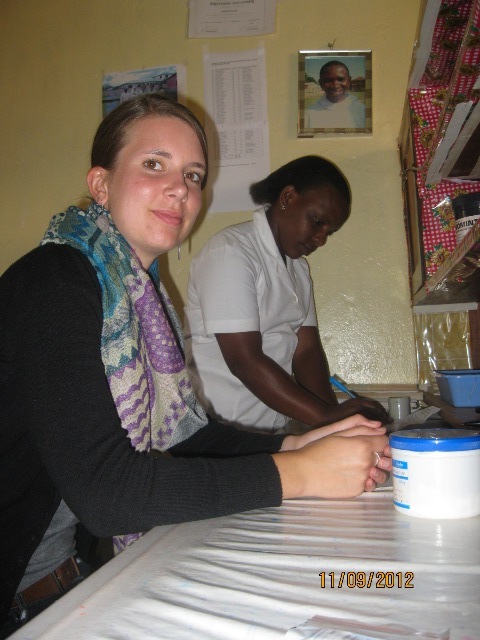 Another volunteer from Germany, a farmacist, Jana Kobbing, also lended her hands at the dispensary. The abbey is always happy and welcomes volunteers who can stay at the abbey for free accommodation and meals as they do their volunteering work. Our gratitude to all our vulunteers and we welcome any one who is eager to help. 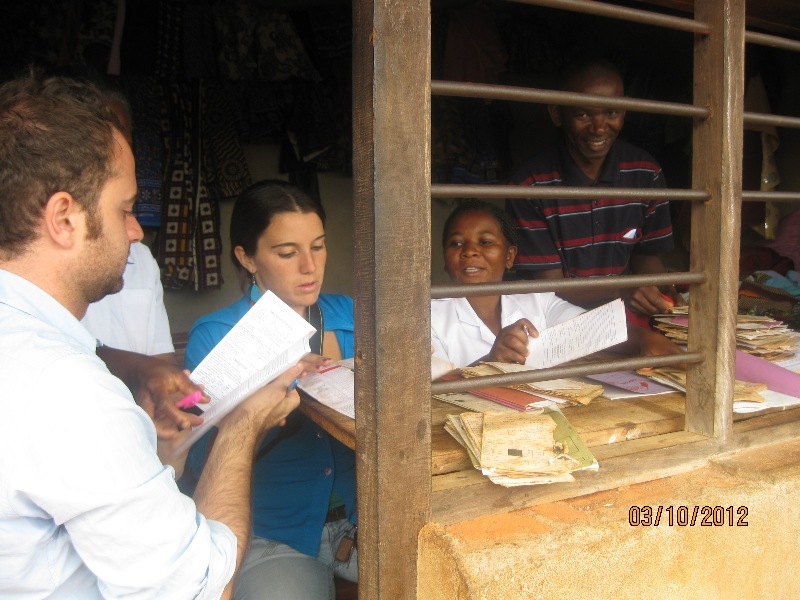 In the photo David is lifting a child for weight taking with Anamaria Ngonyani, a nurse, watching. Below LEFT: Michelle Grandi (left) and Chiara checking cards of children growth records. Far right is Ana Ngonyani and Frater Lucius Matembo, OSB, the dispensary head. RIGHT: is Jana Kobbing in the dispensary pharmacy room with Bertha Mligo, a nurse. St. Benedict Secondary School, one of the schools run by Hanga Abbey, witnessed another year of celebration for 78 students who graduate Secondary school education this year 2012. The graduation ceremony was held on the 29th September at the school grounds. These boys and girls will be sitting for their National Examinations this October. We pray that they do well in their exams and that the Benedictine formation they have acquired at Hanga will make them become good citizens of the country. Pictured below is the graduating class of 2012. Fr. Mugaga, OSB, the headmaster is in white habit, and to his left is Frater Lucius Matembo, OSB, our reporter. Hanga Abbey is involved in many ways in the formation of young people especially in its schools. At Nakagugu Formation House boys who finish Primary School Education come here for formation in spirituality, morality and academic in preparation to joining Secondary School Education. Their formation is geared to have them in the future consider priestly or religious life. This year 2012 in September 42 boys finished their formation year and as they leave the place they go to join Secondary Schools many of them will land in Seminaries. We thank our formator monks at Nakagugu Bishop PlacidusGervas Nkalanga, OSB, Frater Wenceslau Haule, OSB, and Frater Odilo Matembo, OSB. We wish thes young people success in their life aspirations. Pictured below are the boys who graduated in September 2012.